Can you guess what this might be called? Right you are! A B A B form. This is also known as "verse-chorus" form. Can you think of a book of songs made mostly out of A B A B form songs? Sure. A hymnbook. Verse 1, chorus, Verse 2, chorus, Verse 3, chorus, etc. Whether a hymn has 1 verse or many verses, as long as it has a verse-chorus form it is called A B A B form. Since every song has a form of some kind, so you can do yourself a HUGE favor and begin to look at songs with an eye to figuring out their musical form! Why? Because if you can recognize a song as an A A B A form song, all you have to do is determine the chord progression of the "A" section, and you've automatically learned 3/4 of the song! All that remains is learning the "B" section, and you've got it. This week I want to share with you the most-used chord progression in the world, bar none. It's been called the "We Want Cantor" progression, the "Blue Moon" progression, the "Heart and Soul" progression, and other names. I'm going to call it the "2 kids at a piano" progression. The reason I call it that is because when I was a kid I used to play this progression (long before I knew what a progression was!) as a duet along with my brother, or my cousin, or a friend. I'm not a kid anymore, and yet I still hear that progression over and over and over again anytime there is a piano sitting around and a couple kids in the room. One kid takes the top part (the melody), and the other kid plays the bottom part (the chord progression). You've heard it too. At least a zillion times. The formula is easy: I - VI - II - V. In other words, one measure of the I chord, one measure of the VI chord, one measure of the II chord, and one measure of the V chord. And then repeat as many times as you want, or until some adult says, "Would you kids please stop banging on that piano?" 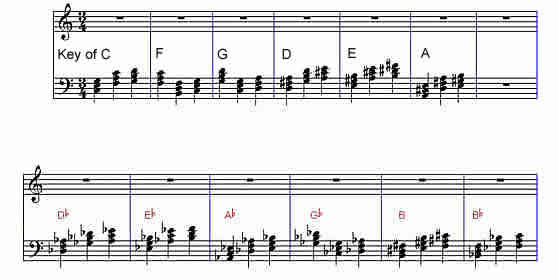 Next week we'll look at some variations by using "embedded chord subs" in the Blue Moon progression. See you then.